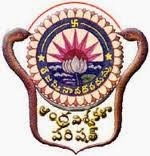 Andhra University school of distance education announces results of BA 1st year, BCom 1st year, BCM 1st year & BSc 1st year on March 18 2014. Andhra University distance education results are available on Andhra University school of distance education official website. Students who wish to check their results may visit the below mentioned URL to check their results. BA, BCom, BSc 2nd year and 3rd year results has already been announced earlier this month. To check your results just visit the link provided above. On the page you'll find links to check your results. Just click on the link and a PDF file will be downloaded on your system. The PDF file contains all the roll numbers of students who has cleared the exmination. All the students who owes no dues to the school of distance education will get the result statement by mail to the address furnished on the examination form. Students who want re-valuation of their scripts may contact Deputy Registrar, School of Distance Education, Andhra University within a period of 30 (Thirty) days from the date of Publishing the results at the Office of the School of Distance Education. The result of the re‐valuation will be communicated to the candidates directly. Students may not apply for a duplicate marks sheet or a provisional degree certificate within 30 days period after results are announced. We hope students who were waiting for their results will be happy reading to this news. Now they may apply for higher education post graduate course. We've see most of the students prefer to join a MBA course after graduation and some joins MCA. You can browse through our blog by typing your query in the search bar available in the right sidebar to know more about courses available after graduation. If you've any query kindly contact university officials.